If you are looking for the best outdoor projectors, then you are definitely on the right place, we’ve prepared this best outdoor projectors reviews and buyer’s guide to make your buying process simple and to help you choose the right one for your needs. Note that buying a projector, especially for outdoor use can be hectic since most of them are meant for indoor use. The projectors in this article can help you to conduct school or work presentations; you can watch cinema, backyard movies and any sort of entertainment that you want to watch under a bright environment. You know how hard it is to watch a movie or do a presentation in broad daylight, but with these projectors, it is possible and easy. We’ve extensively researched, interviewed people who use outdoor projectors on daily basis, tested different models and types of projectors on the market and picked only the best. We’ve picked the best based on the essential features like the brightness, resolution, connectivity options, and audio. Note that there are many things to consider when choosing the right outdoor projector for your entertainment and other needs. We will cover all that and at the end are frequently asked questions to help you make an informed decision. When customers purchase our best-selected products, we may earn a percentage of the purchase made to support our research work. Check the best outdoor projector on Amazon. The market is saturated with plenty of models of projectors from different companies and it is easy to think that the most expensive one with plenty of features is the best for your needs. Note that the best projector for your needs may not be costly neither would it be cheaper. Another thing is that most projectors in the market today are designed with indoor usage. However, some models can be used both indoors and outdoors. When projectors were introduced, they were exclusively designed for indoor usage. Thankfully, the latest projectors can be used in both environments and some can work even without a projector screen. Brightness: It doesn’t matter which type of projector you choose, but what matters is the brightness it can project onto your screen. The brightness of a projector is measured in Lumens. The projectors on the market today come with 1000 to 10000 lumens. The more the lumens, the more costly the projector will be. To get the best outdoor movie projector, you need to choose one with lumens between 2,500 and 5,000 minimum. Resolution: Similar to photographs, a projector with high resolution delivers sharper and clearer images. Thankfully, today you can get a cheap outdoor projector dent on your wallet. Importantly, you get what you pay. So, always look at the resolution of a projector before you purchase it. Contrast Ratio: Another thing you should consider is a projector with a high contrast ration. In fact, we recommend you to buy a projector with a minimum contrast ratio of 1000:1 to get the most out of your presentation, movies, and other entertainment. Buying a projector is a costly investment and so, we want to help you pick the best for your needs. So we’ve considered the simplicity of use of the projector, value for money, and those with excellent features. We’ve also considered how they project under different environments and presented you the best you can use under varying circumstances. If you want the best outdoor projectors for your school or work presentation, watching movies or cinema, then you are in the right place. You could be in a hurry and you don’t have the time to go from one store to another in order to get the best models. Below, we’ve reviewed the 5 best projector models you can get on the market today. Take a few minutes of your time to read before you choose your suitable one. This reasonably priced outdoor projector boasts excellent features such as the 1280 x 800 resolution with a brightness of 3600 lumens, a dynamic contrast ratio of 22000:1 contrast ratio plus a screen size of 105 to 260 inches. This projector comes with enhanced color technology and incredible sharpness and is equipped to accommodate a range of inputs and is also capable of resisting dust and most importantly last longer. 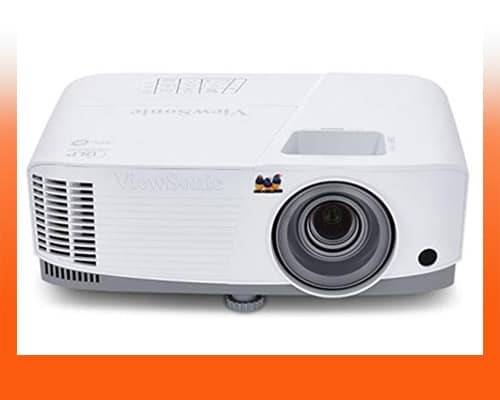 Another incredible thing about the Viewsonic PA503W is that it comes with a maximum lamp life of 15000 hours economic mode, plus the flexible connection options, audiovisual features, and budget-friendliness make it the ideal projector for creating work or school presentations. What’s more? This projector can work well with Mac and Windows, plus you can also connect it with Amazon FireTV, DVD players, Google Chromecast, Blue-ray players and many other multimedia devices. 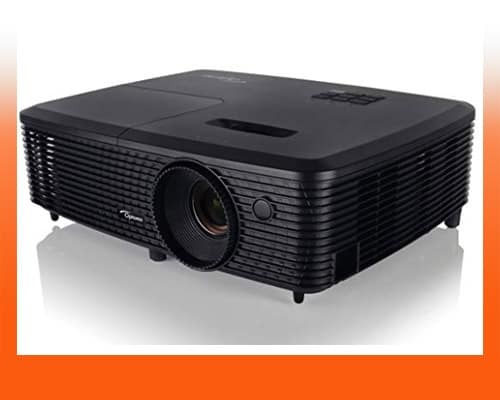 Moreover, it is a user-friendly projector and can make a good choice for home theatre enthusiasts due to its excellent audiovisual features and numerous connectivity options. The reason why we recommend it as the best overall is that it packs a high contrast ratio, high resolution, plus a higher brightness that makes it project clearer and sharper images in varying environments, whether outdoors or indoors. It also features SuperEco color technology so can dim its brightness by up to 70 percent, to minimize the lamp’s power consumption and this extends the lamp life. The projector will allow you to enjoy Full HD content without experiencing any lag issues or rainbow artifacts. If you want to use it for gaming purposes, this projector packs 16ms input latency so, you can play your favorite games with friends. When it comes to connectivity options, this projector accepts VGA, HDMI, Mini USB, Composite video, Audio 3.5mm, RS232 and more. It is a durable projector that comes with a 3-year service warranty and 1-year lamp warranty. It features easy to focus and keystone configurations. You will have to purchase external speakers. 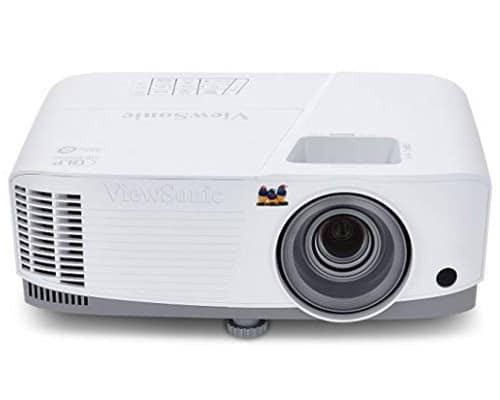 The ViewSonic PA503W is a projector designed to deliver excellent performance and to provide value for your money. 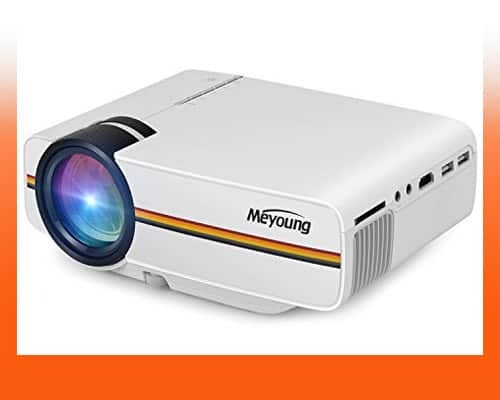 The projector packs remarkable features to make you watch, movies, play games and make work or school presentations without experiencing any problems. If you are looking for the best outdoor projectors, then this one would make the best choice for you. The good thing is that it can work on any type of environment whether outdoors or indoors. When it comes to the projector market, Epson is the leading brand. The company is trusted for making the best electronic products. And in fact, if you visit most schools and business offices, you will find they use Epson projectors. 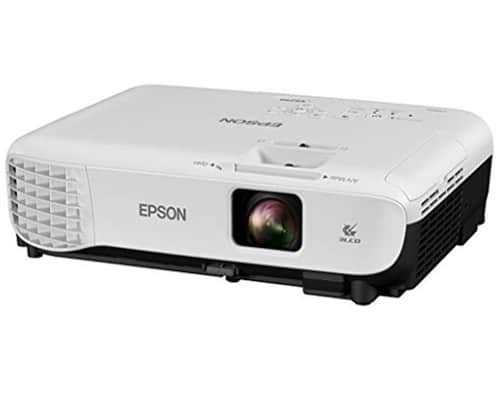 The Epson VS250 is one of their best outdoor projectors equipped with 3200 lumens of color and brightness. This makes it the best for projecting daily graphics and work or school presentations. Setting up this projector is easy and takes a few minutes to get it projecting. Why buy the Epson VS250? It accepts all the modern laptops and multimedia devices. 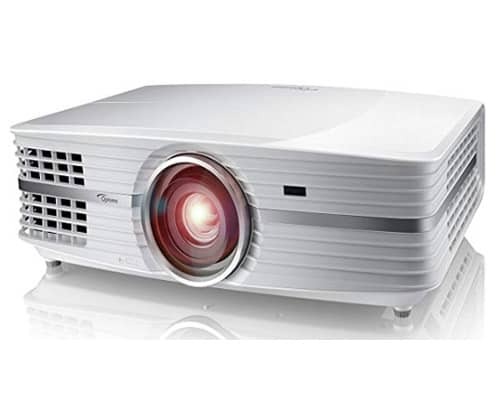 The VS250 is an HD projector offers high brightness and color with a native resolution of 800 X 600. It allows flexible connection options and comes with iProjection App that makes it easy to control the projector using iPhone, Android or iPad. The brightness of this projector makes it powerful to make brilliant presentations under bright sunlight. It also offers amazing color accuracy as it includes 3LCD reflective technology which also makes it to project clearer and brighter images. The good thing about this projector is that it is lightweight so, if you like traveling, this would be your best choice. 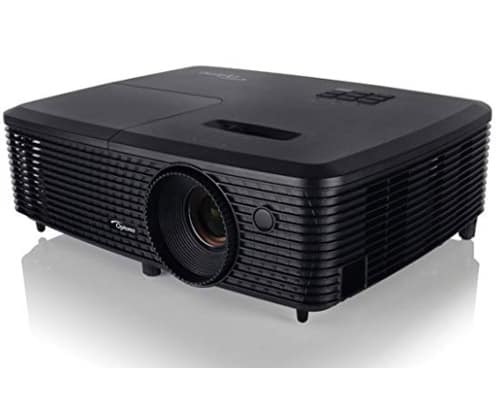 If you are looking for a projector you can use on pretty much anywhere, then this model would be your best choice, plus the fact that is features a contrast ratio of 15000:1 that delivers good clarity makes this projector the best choice for almost anyone whether in school, offices, and entertainment purposes. 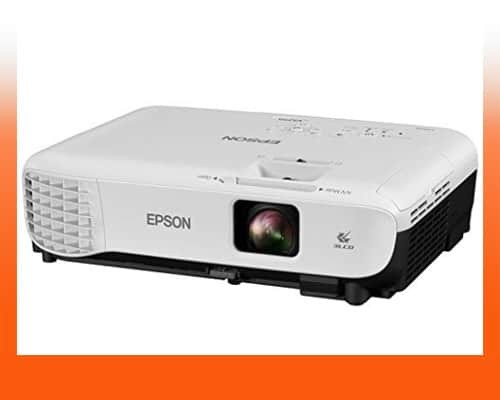 If you are looking for an affordable yet a projector equipped with outstanding features, then the Epson VS250 would be the best choice for you. This projector is great when it comes to regular projecting of graphics and presentations under varying environment. It will also allow you to watch your favorite movies in your backyard. Meyoung TC80 is perfect for you to play with Xbox, PlayStation, and many other gaming consoles. This LED Mini projector is made to deliver HD Video display and is compatible with a range of gaming consoles, laptops, PCs, DVD players, Smartphones and other multimedia devices. It has a high brightness at 1200 lumens, but you have to try it outdoors to see how it projects in a 130” widescreen. This is a compact designed projector made to produce excellent visual quality in a range of environments and is the best under 200. This Mini projector is small in size so you can carry it anywhere anytime, plus you can watch an outdoor movie on a large screen. The good thing about this projector is that you can use it with PCs, laptops, DVD players, Blue-ray, Gaming consoles and other devices. Also, you can use it with your smartphone or tablet to watch movies. It is equipped with 1200 lumens of brightness which promotes watching of vivid visual quality even under light pollution. The contrast ratio of 1000:1 promotes clarity level and black depth. Moreover, the projector can support up to Full HD resolution so you don’t have to get concerned about its 800 X 480 native resolution. It is also equipped with a built-in speaker; however, if you want to enjoy a good outdoor entertainment, you will have to use external powerful stereos. The greatest thing about the projector is that it is ideal for both indoor and outdoor projecting. The best outdoor projector is one that features outstanding features and can be used with a range of multimedia devices under varying environments whether indoors or outdoors. 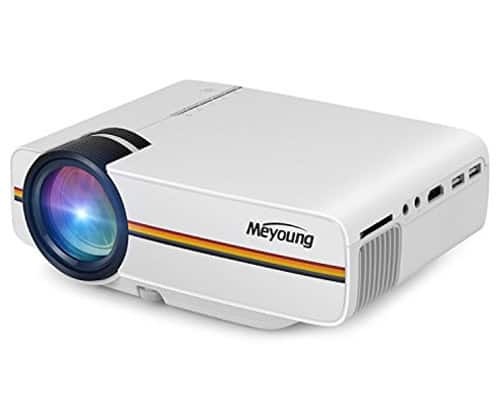 This projector offers you all that, plus the fact that it is the best-rated projector under 200 and the affordability it offers make it the best for people working on a tight budget. The Optoma X341 is a multipurpose projector that delivers outstanding performance both outdoors and indoors. Coming as an upgrade of the Optoma X316, this model packs impressive features you would want to have from the best outdoor projectors. It is a portable and Full HD 3D compatible. This projector comes as a surprise bearing in mind that the name is less known in the projector market. It features an amazing visual performance. The projector features a 1024 X 768 XGA native resolution that promotes visual quality. To make consistence vividness in outdoor entertainment, it packs 3300 lumens of brightness. It black depth features 22000:1 contrast ratio. The projector doesn’t only surprise users with amazing features but it is also a budget-friendly model yet delivers high color accuracy since it features the sRGB display and BrilliantColor technology. What’s more? This is a fully compatible 3D DLP projector and packs superior lamp life of 10000 hours in economic mode. It can project Full HD 3D content from PCs, Blu-Ray players, and other media devices. It can also project content on any surface using wall color adjustment technology. If you want to project content in an open environment, this projector offers you a size range of 28 and 305 inches. With this projector, you can make your presentations any time during the day since it delivers bright and clear images without being interfered by sunlight. It is the ideal projector for classrooms and conference rooms. The good thing about the projector is that it is equipped with energy-saving features to minimize its energy consumption. Offers plenty of connectivity options such as HDMI, Audio in/out, VGA and USB. You need clear visuals with color accuracy and that is what Optoma X341 delivers to you at a budget-friendly price. This projector offers you value for money as it packs incredible features and superior performance all meant to make it achieve its goals. It is a portable and lightweight projector that you can carry it anywhere. 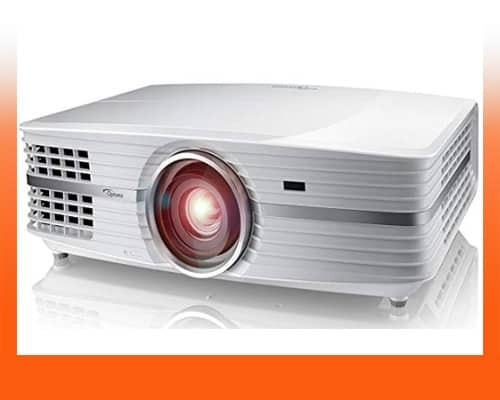 Enjoy super sharp and brighter images with the Optoma UHD60 projector. This Ultra High Definition projector delivers spectacular colors when watching movies and making work and school presentations outdoors. It features a high resolution of 3840 x 2160 and a brightness of 3000 lumens. This is a real 4K projector as it features an incredible contrast ratio of 1000000:1, a dynamic lamp life of 15000 hours and an Eco Mode lamp life of 10000. Aside from the above features, this projector is an HRD compatible which promotes the deepest blacks and brightest whites. It can also project images up to 140 inches which make viewers enjoy 4K Ultra High Definition content from 16 feet away from the screen. Moreover, it offers 1.6 x Zoom and an immense vertical lens shift of 15 percent. Although you will have to pay the price to get this projector, the performance and incredible features that come packed with this unit offers you value for the money you spend. What’s more? It offers you incredible color contrasting and stereo sound. Perhaps, this is the unit you want to buy for your cinema. We would confidently recommend you to buy this durable and long-lasting projector. It might feel costly to buy but the incredible features it packs beat the price. It is quiet even when on full power. This is perhaps a double of your normal projector. It supports a variety of mounting options and projection angles so you can set it up easily. Although it is quite expensive, the features it comes with outweigh the price. The fact that it is a 4K projector makes it a super brighter and clearer projector. This is our overall best outdoor projector with amazing color quality due to it exclusive SuperColor Technology. This projector comes with a native resolution of 1280 x 800 and built-in speakers. The good thing about this projector is that it produces no sound even when operating in full power. Another thing is that it is easy to set up and control. This reasonably priced outdoor projector comes with the brightness of 3600 lumens and a dynamic contrast ratio of 22000:1. It is also equipped with incredible color technology and impressive sharpness. It also boasts a long lamp life of 15000 hours. We would recommend you to buy this projector since you can enjoy your favorite entertainment from various media such as DVD players, Google Chromecast and Amazon FireTV among others. If you are shopping for the best outdoor projectors, then you should not fall for the first one you come across. This means you need to shop around before you can decide which one to pick. But when shopping around, you should consider numerous factors. Regardless of the amount you want to spend or the reasons for buying the projector, you will need to know where you will be using the projector. Do you want a projector you can use indoors or outdoors? Do you want a projector that you can use under bright sunlight? Is it a business or an entertainment projector? Regardless of whether you want it for entertainment, office or school presentations, and gaming you should consider these factors. First things first: You need to know where you intend to use the projector. Note that projectors come with varying sizes and weights. If you intend to carry the projector with you anywhere, you need to choose a compact and lightweight. Not all projectors offer compatibility features. Some are compatible with DVD players and Blu-ray technology and on the other hand, they are not compatible with gaming consoles, Xbox and PlayStation. For this reason, you need to check the specifications of the projector for compatibility purposes before you buy it. This is very crucial. There are projectors that are complex to set up and control. It is good to consider how easy to use the projector is, although many of the latest units come with a remote controller for easy access and control. Well, although this is a factor you should consider, it should not be the determinant of which unit to purchase. Note that you get what you pay, so whether the projector is costly or cheap, you should put in mind your needs before price consideration comes in. The projector market is full of projectors from different brands and this can be overwhelming and confusing to buy yours especially when it’s your first time. While there are brands that are trusted for producing high-quality products, you can still end up buying a projector that won’t fulfill your needs and expectations. To help you out, we’ve compiled a list of important questions with answers to help you in your project buying process. How Easy Is It to Set up and Control a Projector? Almost all the latest projectors are easy to set up and control since they come with a remote controller, however, you should check that on the unit description and specifications before you buy yours. What Is the Perfect Image Resolution? The number of pixels in an image is what is referred to as resolution. The image resolution determines how clear and image will be on the screen. The perfect image resolution for outdoor projectors is 800 x 600 pixels and above. Is There a Need to Buy a Projector Screen? No! You can still use a projector without a screen. However, to get the best image with your projector, you may want to buy a projector screen, however, you can still project images on the side of walls and still get good image quality. Aside from My PC, Which Other Devices Can Be Connected to the Projector? Projectors offer plenty of connectivity options at the back such as HDMI/VGA cables, USB where you can connect your DVD player, laptop, gaming consoles, and servers. What Is the Best Projector Lamp Life? To get the most out of a projector, ensure to buy one with a lamp life of more than 6000 hours on full power. With the numerous models and brands of projectors available on the market today, it can be hectic, confusing and overwhelming to choose the best outdoor projectors for your needs. We understand how stressful it can be and that’s why we’ve decided to prepare these best outdoor projectors reviews and buyer’s guide to help you pick the right one according to your needs. In our list, you will find that we’ve reviewed the best for any type of environment whether indoors or outdoors. We’ve considered numerous factors, tested, tried and finally compiled this list to help you make an informed decision while buying yours. We hope, after reading this article, you will find the process of buying a projector to be easy and enjoyable.